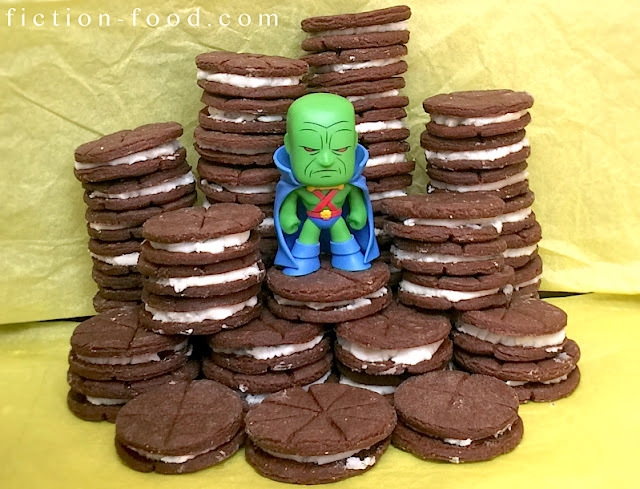 DC Comics' J'onn J'onzz, AKA Martian Manhunter, AKA John Jones, is enamored with the little chocolate sandwich cookies simply known as Chocos, as shown in various comics, TV shows (looking at you, Smallville), and video games. 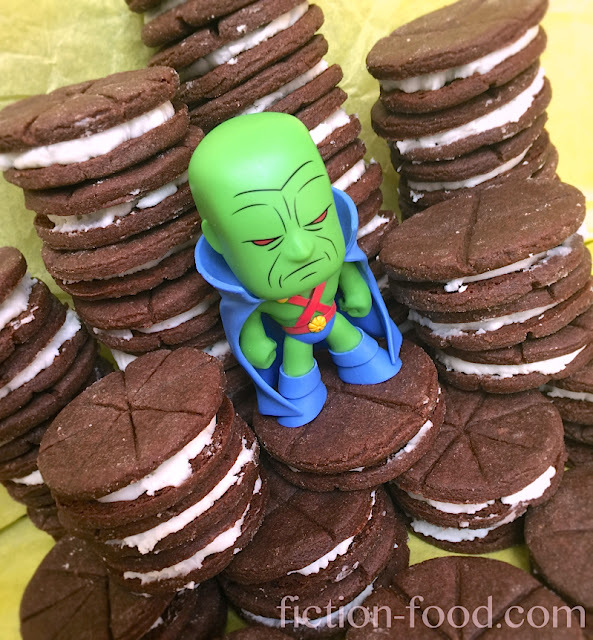 Originally referred to as Oreos but assumedly changed because of copyright issues, there was even a whole comic dedicated to J'onzz obsession (Martian Manhunter vol. 2, issue 24), in which an elaborate prank revealed a very serious addiction. 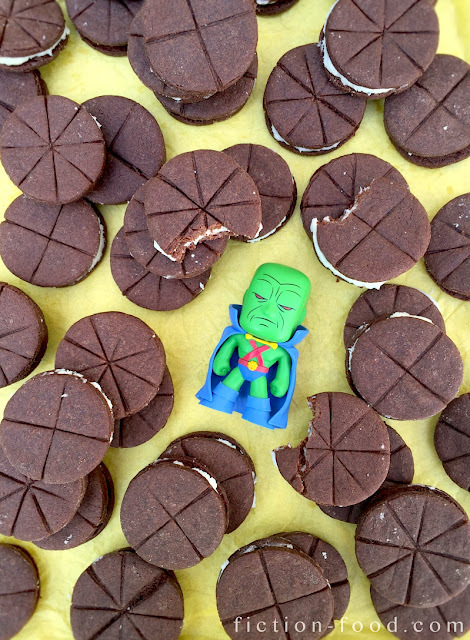 With the combined efforts of his Justice League friends though, the day was saved, though J'onn is still known to indulge in a few from time to time. "You're a junkie. A Chocos junkie!" 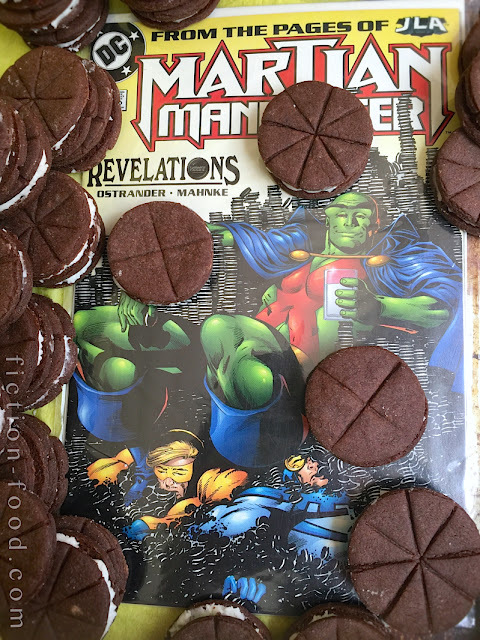 Note: I put two patterns on the cookies, the quarters being the symbol from J'onn's chest, and the eighths being the symbol from his belt. You can choose whichever one you'd like. 1. Filling: Add all of the filling ingredients into a mixing bowl & mix on low speed until combined, & then on high until smooth & creamy. Put this mixture onto the center of a large sheet of plastic wrap & roll into a log about 1 1/2" in diameter & then place in the freezer for about 45 minutes. 2. Cookies: Put all of the cookie ingredients into a mixing bowl & mix on low speed until combined & dough is formed. Plop this dough ball in the center of a large sheet of plastic wrap & press on it to flatten it a little. Wrap the plastic around the dough & place it in the freezer for about 15 mins. 3. Preheat your oven to 350ºF. Line a large baking tray with parchment paper. On a lightly floured flat work surface roll out the cookie dough to about 1/8" thickness & cut into an even number of small circles. Place these circles about an inch apart on the baking tray. Re-roll the dough & cut circles until no dough is left. Using the back of a butter knife, gently press line patterns into half of the cookies; either 4 intersecting lines to get eight sections, or 2 lines to get quarters. Make sure you do not push too far that you cur the cookie! Bake the cookies for 6-7 minutes & then let cool for a few minutes before transferring to a cooling rack to cool completely. 4. Pair up the patterned cookies with the non-patterned ones. Remove the filling log from the freezer & slice it into about 1/8" thick discs with a large sharp knife. Sandwich these discs snuggly between the cookie pairs & you're done! But be careful, they're addicting (well, only if you're a Martian)! Earth: Come for the pretty blue ocean, stay for the cookies.